If you shop at Shoppers Drug Mart be sure you are checking your personalized offers each week! This week there was a freebie available for some Optimum members! I had a couple of readers message me saying they had freebies on their Shoppers app. 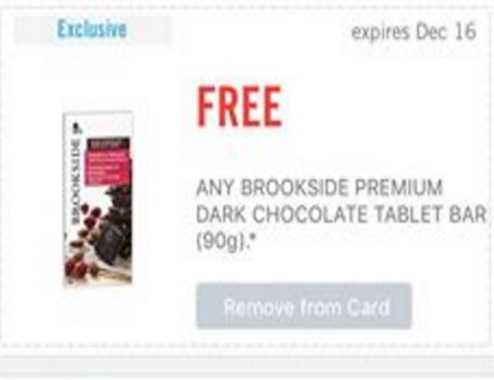 One reader had a Free Brookside Premium Dark Chocolate bar (as pictured above) and another had a Free Dr Oetker Giuseppe, Casa Di Mama or Panebello Pizza coupon. These coupons were valid December 10-16, however the date may vary member to member. These Optimum offers are exclusive to each member so you may not have got any, or you may have got something different entirely. I did not get any freebie offers this week, but I shop there a lot so they probably don't feel it necessary to send me these types of offers! Did you get any good personalized Shoppers Drug Mart offers? Let us know on our Facebook Page here.